Lady Blue is getting a lot of practice with traveling in the rain. Even so, following Route 2 east into Montana is a pretty drive. Our first stop is at Middle Thompson Lake and Logan State Park. 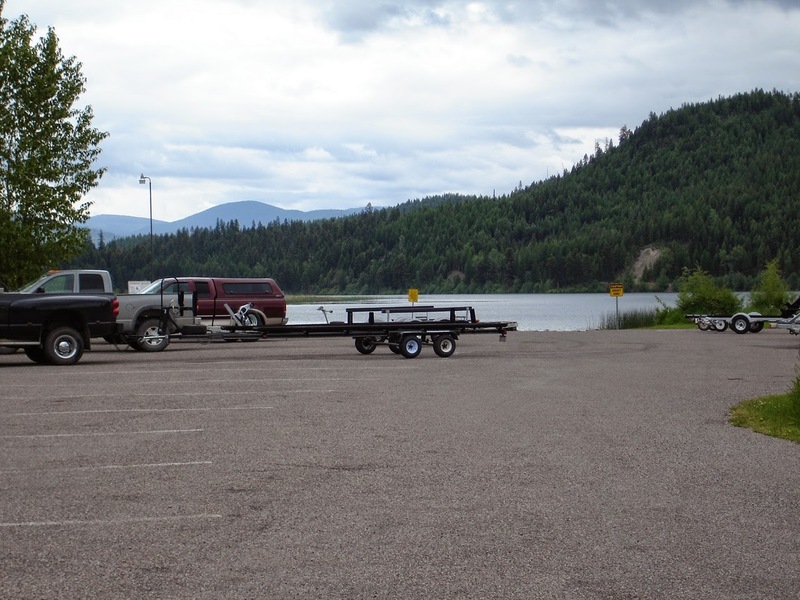 This is a small campground with great boat launch access for fishermen. This picture is just to show easy access. Almost every view in this part of Montana is going to show you mountains. The campers love the fishing. One of the hosts here was also telling us how he had picked up an elk here during the bow and arrow season. He also enjoys hunting further east in Montana for antelope. 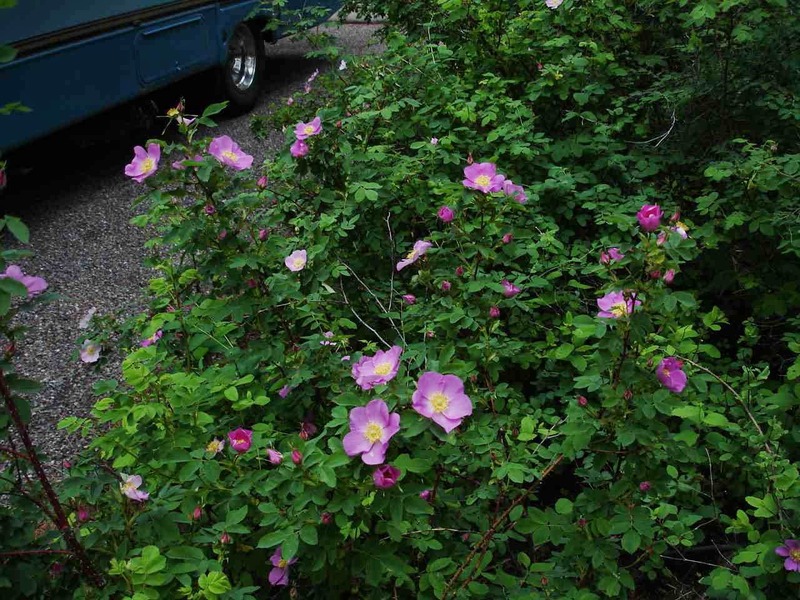 Massachusetts readers will appreciate the abundance of what we call beach roses. They are just coming into bloom here and these are quite fragrant. 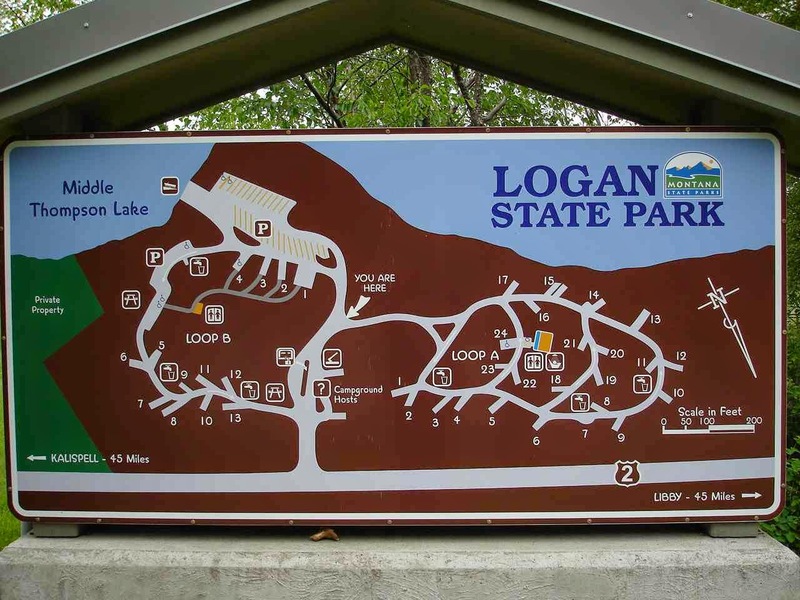 It is a very short drive from Logan State Park to another large lake named McGregor Lake. We just happened to find this private campground associated with The Lodge at Mcgregor Lake--right across the street. We really enjoyed the hosts and the owner of this campground that was only 2 years old. Had a great dinner at the lodge looking out at the lake and talking with the bartender--son of the owner, Jeremy. Beer fans will appreciate that the beer on tap was Hat Trick IPA from a local brewery called Tamarack Brewery in Lakeside, Montana . Very nice! 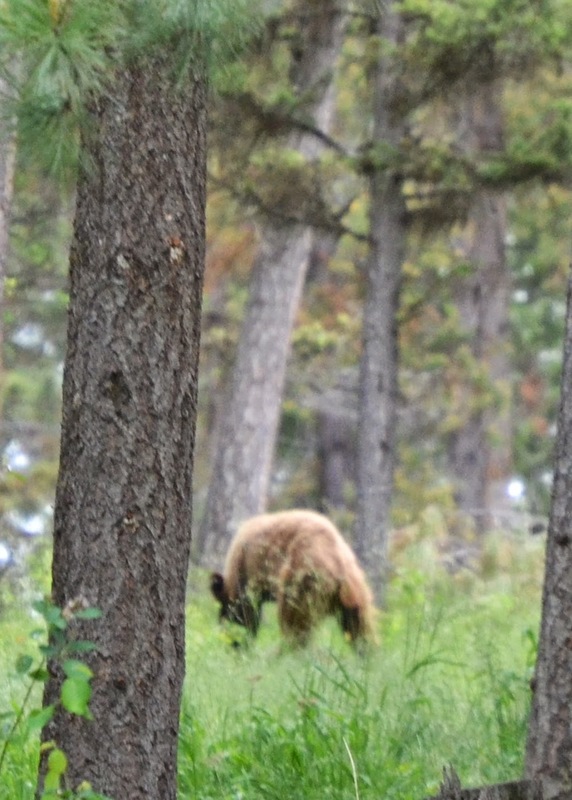 All of us in the campground got excited about this visitor. Not sure what he was after, but he stayed for a little while. This picture was taken by one of the hosts. That was one of two breweries located on Flathead Lake. We were told that it is the largest lake west of the Mississippi. It certainly seems that big. 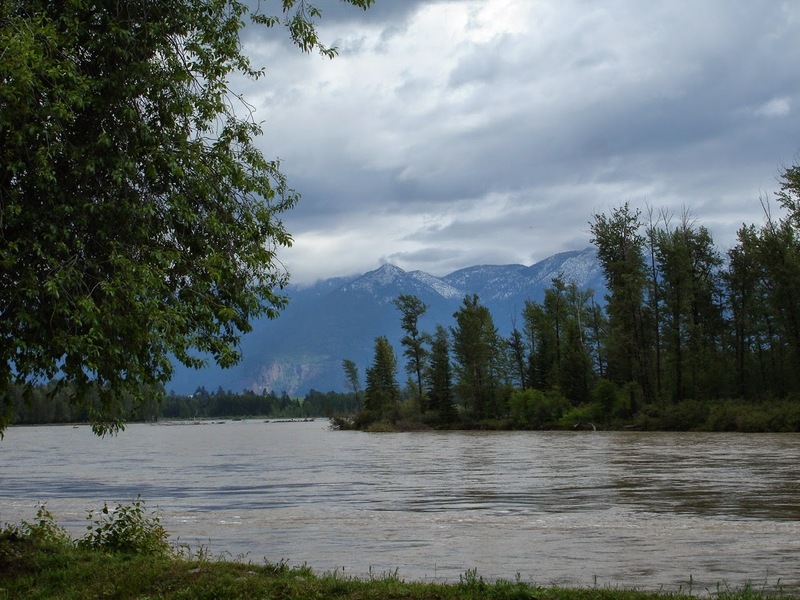 You can find it on the map south of Kalispell, Montana which is about 30 miles or so south of Glacier National Park. Finding a campground here is a bit of a challenge. There are a number of private, state, and national forest campgrounds around, but most of them have a very few number of sites. We lucked out with this nice spot at Finley Point State Park on the southeast side of the lake. When you are fulltime rving, life happens on the road. We know that a number of our friends will ask about "What do you do----for mail, laundry, bills, etc. The big one is "What do you do about doctors?" Well, it's almost the same as being in a stick house, except that you are not anywhere near your regular doctors. However, there are things like the Yelp application that rates or at least lists doctors and dentists. Well-l-l--l. Old Bruce had this problem that started to pop up with an aching jaw and a swollen cheek. I know---you can see it coming-----yep--an immediate need for a dentist. A quick search of Yelp gave us a number of choices in Kalispell. And one review was from a traveler who was quite happy with a Dr. Pittaway. We called and stopped by, and he was able to see me right away. Wonderful people, and though we wound up staying for a few days longer than planned, the problem was resolved quickly. One less tooth, but quite comfortable. This has happened to us over the years, and we have been quite happy with recommendations from fellow campers, online reviews like Yelp, and such. The point is that there is good medical care---and other service providers--all across the country. Our experience has found them to be quite good, professional, and the staff ,very friendly and helpful. So, the dentist was yesterday. This is our view today from our campsite as we wait for the days of rain to finally be over. 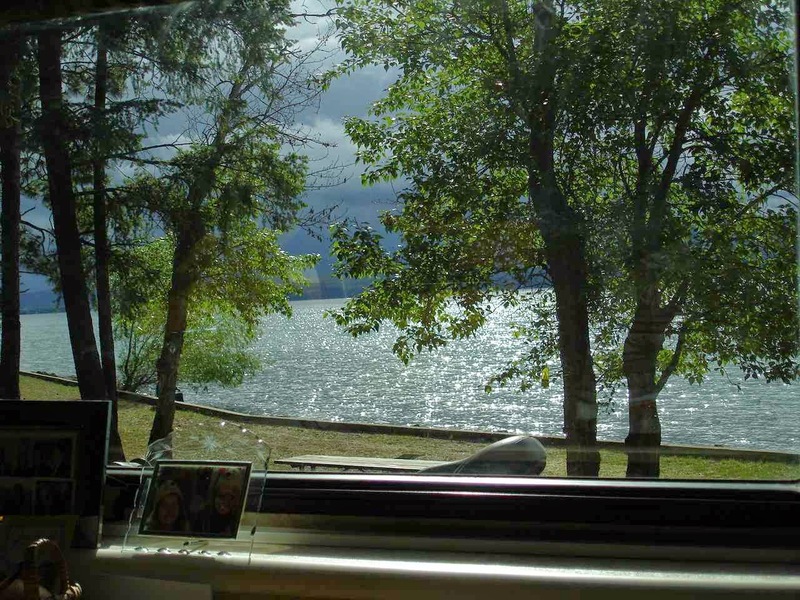 This campground is in Kalispell on the Flathead River. The river is three branches from the Glacier area that join together and then flow south. Today, we are watching the river get very close to the top of the bank. The owner assured us that the river is only at 13 feet. Still 2 feet to go before overflowing. The mountains in the background are part of the Rocky Mountain chain. Parts of Glacier got multiple feet of snow yesterday, so we know that the Going-To-The-Sun Road will not be open. Also, we know that parts of Route 2 were snow covered with some rock slides here and there. But, hopefully tomorrow will begin a great, sunny spell.